To do this you just have to access the dictionaries dashboard (available once you log in to your MeaningCloud account) and click on the big plus sign. 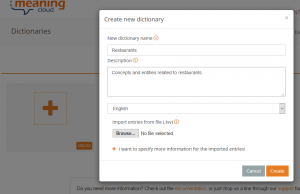 This will open a dialog where you can define the name of your new dictionary (in our case we are calling it “Restaurants“) the language we are defining it for (English), and optionally, a description of the dictionary’s purpose. Once we have created the dictionary, we can start adding the entries we want to detect in the sentiment analysis. In this scenario we want to detect two different aspects: dishes the restaurants serve and qualities of restaurants people talk about in their reviews. To create an entry we need to know three things: the entry we want to detect (its lexical form), if we want it to be an entity or a concept (its entry type), and the type we want to associate to it (its ontology type). Usually the form and the ontology type are quite immediate; the entry type, not so much. A rule of thumb for this is to think of how it’s going to appear in a text and thus, how we want to be able to detect it. For instance, if we want to add “pork belly bun” as a dish, we can guess that they will also be mentioned in plural, while when we talk about other dishes such as “ramen” or “sushi“, we are only ever going to find them like that (we don’t talk about “ramens” or “sushis“). Concepts automatically consider morphological variants as aliases, which means that if we want the plural (or the gender for languages other than English) to also be detected, we can define the entry as a concept, and we won’t have to add it as an alias. Using this criteria to define the ontology types of the entities and concepts we want to detect, we will be able to have them neatly grouped under the same first level type, which will make it easier to work with the results later on. If you do not want to create manually all these entries, you can download this file, and import it directly into your empty dictionary using the default configuration that appears in the import dialog. Now that we have defined our dictionary, we can use it in the sentiment analysis we are doing using the Excel add-in. Configuring it is very easy: when you click on the sentiment analysis button, the dictionaries created with the license key you have configured in the Settings section of the add-in will appear automatically in the User dictionary field. 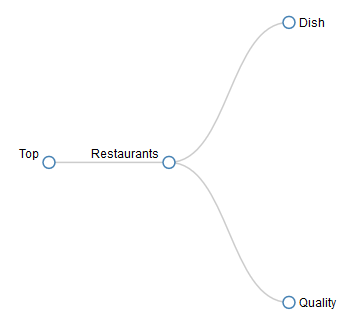 You just have to select which dictionary you want to use, in our case “Restaurants“, and then click on Analyze to start the sentiment analysis. 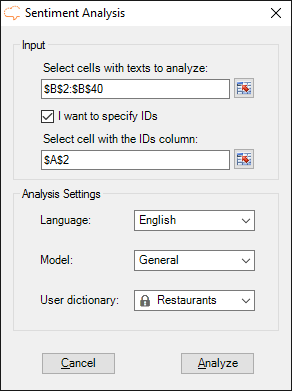 But before starting the analysis, we are going to change something else in the Settings section in order to make it easier to work with the results later on: instead of combining cells when several concepts/entities are detected for the same text, we are going to repeat the text for each element detected. To do this, you just have to deselect the option “Combine cells in the output” in the General settings section in Settings. You can read more about the different configuration options available in the documentation for sentiment analysis in excel. After clicking on Analyze, the process will launch, creating two new sheets in your spreadsheet when it’s done: Global Sentiment Analysis, with the global sentiment results of the texts and Topics Sentiment Analysis, with aspect-based sentiment analysis. We talked about the first one in the previous tutorial, so now we are going to focus on the second one. The first thing we can see is that there are more results than the ones we have defined in our dictionary, which makes it a bit hard to focus on what we really want. This is where the ontology types we have defined come in: if we enable the AutoFilters in the first row of the results, we can obtain a view with just the entries we are interested in. To do so, just click on one of the title cells, and then in the Data ribbon, click on Filter. 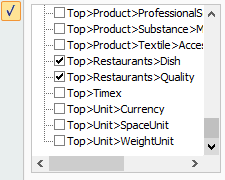 In the filter associated to the column Type, we can select the two types we’ve defined: Top>Restaurants>Dish and Top>Restaurants>Quality. With the new results we can see review by review the dishes that are talked about, and what clients think about the different qualities of a restaurant that we have defined in our dictionary. With this information and using Excel’s tools, we can obtain easily analyses as simple or as complex as we want. 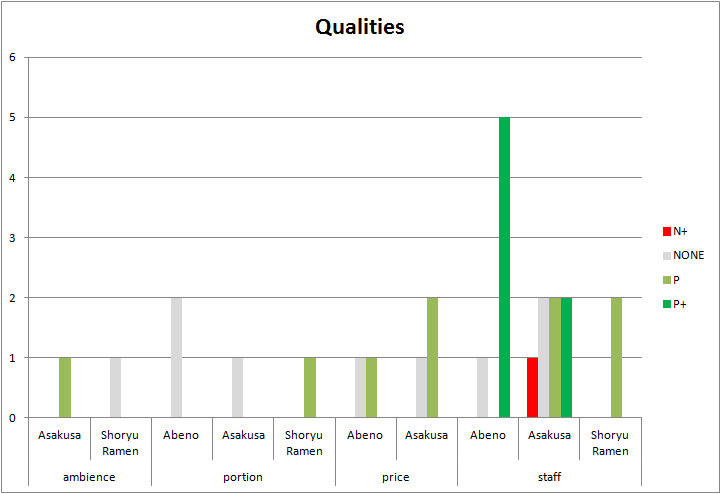 In this second chart we can see the different opinions the reviews offer on the same dishes, so for instance, we can see that the ramen in Shoryu Ramen has mixed the reviews, while the okonomiaki in Abeno seems to be a hit. 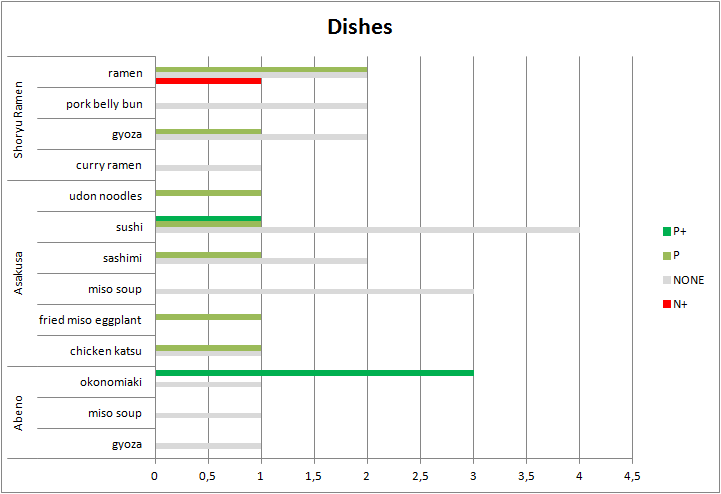 You can download the spreadsheet with the results and the analyses we have just described here. As you can see, detecting the polarity for you specific domain is fairly easy, and once you’ve defined what you need, you can combine it with any kind of analysis you want to add to your usual workflow. Stay tuned for our next tutorial, in which we will show you how to improve the sentiment analysis in your domain by using sentiment analysis. And of course, if you have any questions, we’ll be happy to answer them at support@meaningcloud.com.